Author: CHAPPELL,JENNIE, LUCY L. WEEDON, F.M. HOLMES, A. COLLYER, FRANCES E. HUNT ET AL. Title: LEFT IN CHARGE and Other Stories. Description: London, S.W. 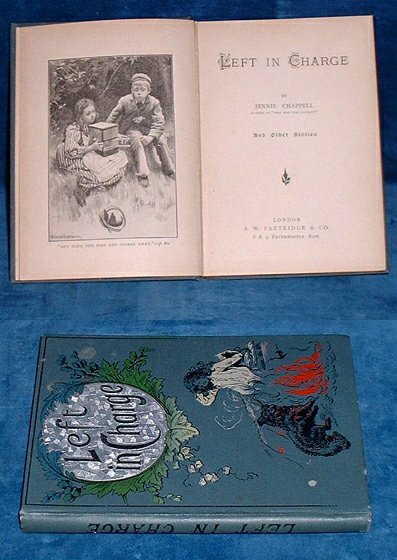 Partridge & Co. 1900 approx) Plates (6) by Harold Copping & others. . Duodecimo blue pictorial cloth with silver titling panel to cover (slightly marked/tips rubbed but entirely sound and nice) 64pp + 16pp Publisher's catalogue. Reward inscription on fly leaf to Herbert Bagley from the Wesleyan Sunday School Scothern 1900. Slight edge tanning but clean and tight with 8 stories. Aside from the title story inlcudes Jennie's Bird by Lucy L. Weedon; What The Rabbits Did by F.M. Holmes; Crack! Crack! A Tiger Story by A. Collyer; Benjamin Bond by A. Eva Richardson; Puff's Adventure by Jacey; Bobo: A Story of a Monkey by Mary Gorges; Stanley's Revenge by Frances E. Hunt.